Having been in the laptop business for a good 25 years, Toshiba has always been one to try and innovate what already exists rather than rip up the rulebook all together. Then it decided to release both the AC100 and Libretto W100 – two products which go against the curve of what is already out in the market. 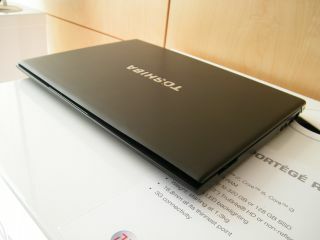 Alongside these, however, is the Satellite R630 – a traditional laptop with some impressive features. Inside the slim-ish chassis, Toshiba has managed to chuck in Intel's latest Core 'i' processors, making the laptop one of the most powerful for its size. Consumers have the choice of either the i3, i5 or i7 chip so no matter what your computing needs Toshiba seem to have it sewn up with the R630. To make sure that the laptop doesn't melt, Toshiba has created a whole new cooling system for the R630 which it has aptly called Airflow Cooling Technology. This means that the Core 'I' chips can work well without fear that your laptop will overheat. In fact, Toshiba says that you should feel no notable heat at all when using the device. The laptop is also slim at 30mm, which is fantastic considering the amount of power which has been packed into the machine. The chassis for the R630 is made from magnesium alloy so is certainly a tough nut to crack – Toshiba has tried from 70cm and it didn't break – while the keyboard on show is passable, if a little on the boring side. The screen is a bright 1366 x 768 and text and images on it look clear. Inside is 4GB of memory as standard which is more than fine for most tasks you want to do on the laptop and battery life is quoted at nine hours. This is even longer than most netbooks can boast at the moment, but we would need it in for tests to see if what sort of conditions would make the battery last this long. As for connectivity, there is an impressive 3x USB2.0, 1x eSATA / USB combo port and a multi-card reader, VGA and HDMI ports. For those who like the look of the Satellite R630 but wished it had more business appeal, the laptop is also coming to the UK as the Portege R700, with added docking connector with USB 3.0 and HDMI support, EasyGuard security technology and a Fingerprint reader. Both the Toshiba Satellite R630 and Portege R700 have a UK release date of August 2010, with pricing starting at £630 exc VAT.